Preheat the oven to 375°F. Wash the potatoes under cool water and then pierce each with a fork twice. Bake in the oven for 45 minutes to 1 hour, until fork tender (time will vary baked on potato size). Slice the potatoes in half along the length and separate the halves. Use a spoon to scoop out the insides, leaving a thin layer of potato around the edge. The potato insides should be scooped into a medium mixing bowl. Once all the potatoes have been hollowed out, add the milk, salt, cheddar and pepper to the bowl. Use the tongs of a fork to mash the mixture together. Once it's well combined, stir in the cooked broccoli. Spoon the potato mixture back into the potato shells, evenly dividing it between them until it's all used. Place all the potatoes on a foil-lined baking sheet and bake for 20-25 minutes, until lightly browned and heated throughout. When you say “twice-baked potatoes,” you can’t help but get caught a little in the work that a two-bake dish probably requires. It makes it super easy to just discard the idea of making them, in favor of something perceivably easier like mashed potatoes. But guess what? Twice potatoes really don’t involve much more effort (though they do take a little more time to make). If anything, twice baked potatoes are easier than mashed potatoes. With mashed potatoes, you have to wash, cut, boil, mash, season and mix. With twice-baked potatoes, you wash, bake, scoop, mix, fill and bake again. And unlike good ol’ mashed potatoes (which I love), twice baked potatoes are super simple to make ahead, breaking up the steps. For instance, you could bake the potatoes in the morning and then make the filling after work and then just bake ‘em up. Or you could bake the potatoes the night before, mix and fill them in the morning and them bake when you get home. Heck, you could do all the steps up until the second bake and freeze them for later use. 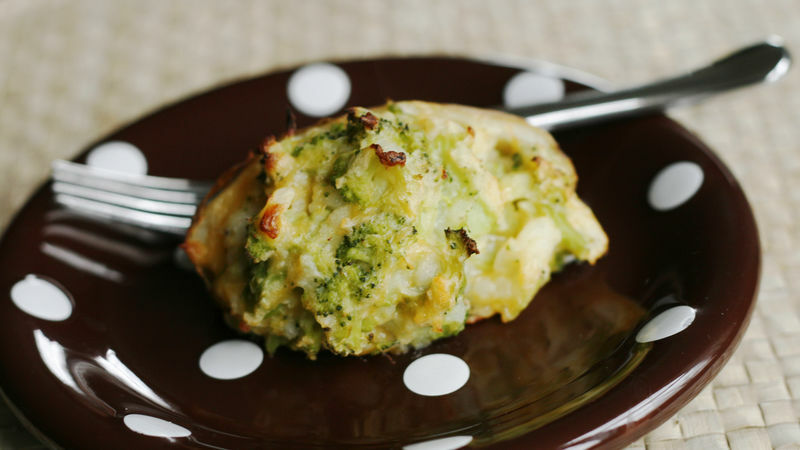 This particular recipe for Broccoli and Cheddar Twice Baked Potatoes is filled with lots of broccoli and cheddar. And it’s all made simpler by using frozen chopped broccoli, which cuts way down on prep time while still giving you fabulous, fresh veggies. My kids love these, especially because there is so much broccoli in them that the insides practically turn green. And they think they are fun too, since it’s like eating their favorite smashed potatoes from a potato bowl. Have you ever made twice baked potatoes? Tell us about it below!